Before the official release of all-new Google-made LG Nexus 5 Smartphone, the rumors and leakages are already spreading on internet regarding the Official Specifications, Features, Availability and Price of LG Nexus 5 with Review. In our previous blog-post we had already shared the Leaked Images of LG Nexus 5 Running Android 4.4 Kitkat mobile operating system. It is already confirmed from Google and LG, that new Nexus 5 Smartphone will be powered by all-new Google's Android 4.4 Kitkat OS and both technology will be reciprocally introduces to the consumers worldwide at upcoming Google's Official Event. 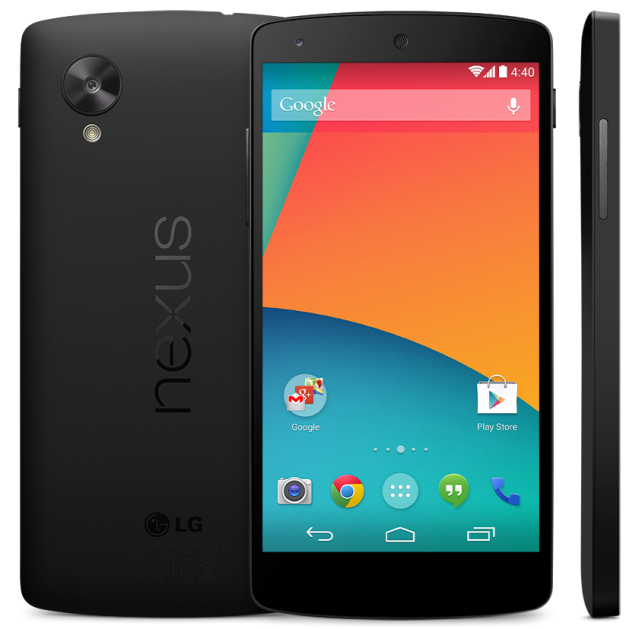 So today, in our blog-post we will share the Expected Un-Official Review of LG Nexus 5 Specifications, Features, Availability and Price Details because we know many Android and Nexus device lovers wants to know what LG and Google is delivering to them in the shape of Nexus 5 and Android 4.4 Kitkat. So let's find out below. According to unofficial sources, LG Nexus 5 device will be powered by Android 4.4 Kitkat OS with Quad-core 2.3 GHz Krait 400 CPU, 3 GB RAM with 16/32 GB storage and 8 MP Camera 4128 x 3096 pixels with LED flash, autofocus and display screen of 5.0 inches,1080 x 1920 pixels. More specs and features details are available in below Infographic. According to rumors, it's still expected that LG Nexus 5 with Google Android 4.4 Kitkat OS will be announced and released in this month or mid-November, 2013 in upcoming Google's Official Event. According to some Google Play Store users, LG Nexus 5 Smartphone were actually appeared and displayed at Google's Play store website some days back with the official price tag in black, with 16GB of storage memory but now the link has pulled already but thankfully, we got a leaked official price tag with official screenshot of the device. The Expected Un-Official Price of LG Nexus 5 Black model will be $349 USD for 16GB storage Or €260 EUR, but no price was displayed for 32GB model. As soon as we get more updates on LG Nexus 5 Smartphone, we will update you, so subscribe for newsletter below.